Dinosaurs stomp, they roar; and so does preschoolers' imagination and creativity. Dinosaur books are an excellent base for learning about animals and some history. 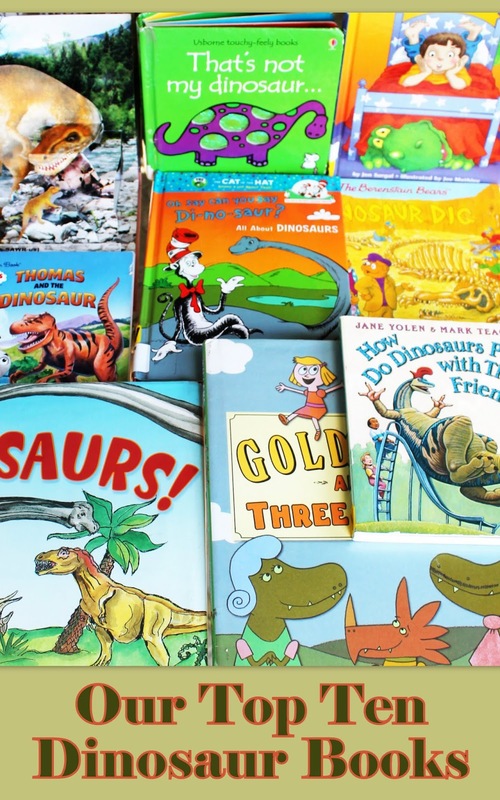 Today we are sharing our top six dinosaur books, and several more our 3-4 year olds liked to listen to this year. The links bellow are Amazon affiliate links. Goldilocks and the Three Dinosaurs: As Retold by Mo Willems by Mo Willems. The little girl had almost got eaten by the three dinosaurs. This is a funny Goldilocks story with the happy end of course. Dinosaurs! by Gail Gibbons. Easy engaging texts with excellent illustrations are a big help for learning something new about dinosaurs. Have You Seen My Dinosaur? (Beginner Books(R)) by Jon Surgal. Who said that dinosaurs lived before people and that there are no dinosaurs left on Earth? There is one, a big huge green one, playing around. Nobody could spot him, just yet! That's Not My Dinosaur (Usborne Touchy Feely) by Fiona Watt. Kids would literally drop everything exciting they were doing to come and touch, and retell this book. I like how books from this series teach little ones to use adjectives. The Berenstain Bears' Dinosaur Dig by Jan Berenstain and Mike Berenstain. Here is just one more dinosaur book from the beautiful Berenstain Bears' series. How Do Dinosaurs Play with Their Friends? by Jane Yolen. Can we learn some manners from dinosaurs? They can be wonderful friends if they want to! Oh, Say Can You Say Di-no-saur? (Cat in the Hat's Learning Library) by Bonnie Worth. Cat in the Hat's Learning Library offers kids a book on pronouncing those long dinosaur names (using fun rhymes of course). Curious George's Dinosaur Discovery by H. A. Rey. My Firefly loves listening to Curious George's stories: there is always something exciting happening there! Thomas and the Dinosaur (Thomas & Friends) (Little Golden Book). This is a little story about a huge dinosaur model for the new Dinosaur Park. The breaking news is that those huge models are not real dinosaurs. Distinctive Dinosaurs Pop-Up Book by Steve Van Buskirk. There are only five dinosaurs and landscapes in this little books, as well as a short info for each of them. This little pop-up book is not heavy for the little hands - pretty cute. The Good Dinosaur Little Golden Book (Disney/Pixar The Good Dinosaur) by Bill Scollon. This is a fun retelling of the new Disney's The Good Dinosaur. What are your favorite dinosaur books?